Perfect for all home interiors, the clean crisp line of Venetian Blinds give an uncluttered look to the window. perforated, aliwood and pearlised. 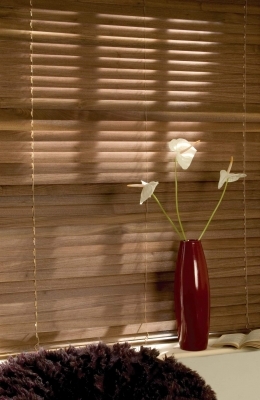 The natural look of wooden blinds adds style and character to any room. Wooden venetians come in three slat widths 25mm, 35mm and 50mm and we offer a wide range of colours to harmonize with your surroundings. A selection of our best selling timbers comes with the addition of cotton decorative tapes, an increasingly fashionable look.